1.1 Southwest Monsoon conditions continued to prevail in the first half of October 2017 and gradually transitioned to the inter-monsoon conditions in the second half of the month. The prevailing southeasterly to southwesterly winds over the ASEAN region gradually weakened to become more light and variable in direction. Figure 2: Percent of Normal Rainfall for October 2017. The rainfall data may be less representative for areas with a less dense rainfall network. 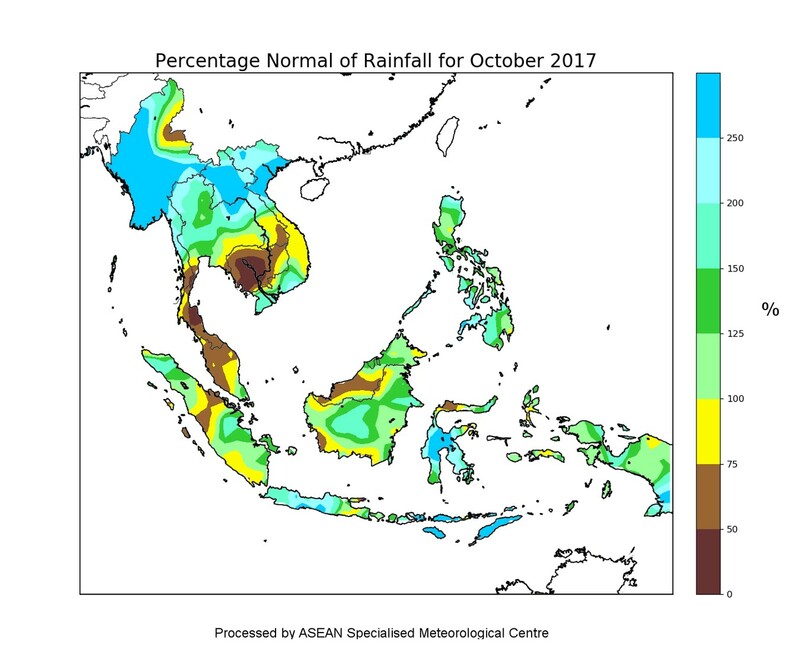 1.2 During the month, most of the shower activities fell over the equatorial region between 5 S and 15 N. Figure 1 shows the rainfall distribution over the ASEAN region during the month of October 2017. Rainfall was below-normal over the eastern and southern parts of Thailand, and over the northern parts of Peninsula Malaysia and parts of East Malaysia. For most parts of the ASEAN region, rainfall was normal to above-normal. Figure 2 shows the percent of normal rainfall for October 2017. 1.3 The occurrence of several tropical cyclones in the first half of October 2017 brought heavy rainfall to some parts of the northern ASEAN region. Among these tropical cyclones, Tropical Depression ‘23W’ and Typhoon ‘Khanun’ brought heavy rainfall and strong winds to the Philippines and Vietnam. 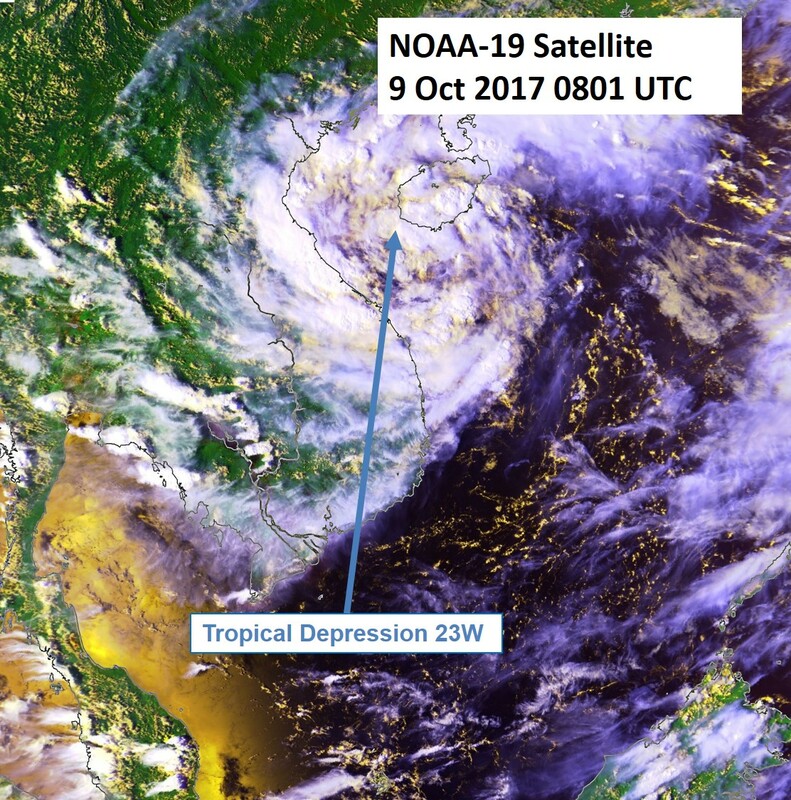 Tropical Depression ‘23W’ developed over the South China Sea on the 9 October 2017, which tracked west-northwest and made landfall over the northern coast of Vietnam on 10 October 2017. On 12 October 2017, Tropical Storm ‘Khanun’ developed over the east of Luzon in the Philippines. 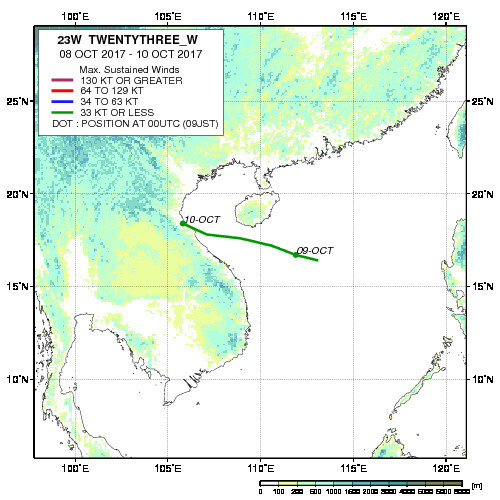 It tracked westwards and intensified into a typhoon over the South China Sea on the 15 October 2017, and continued to track westwards before making landfall over the southern coast of China. 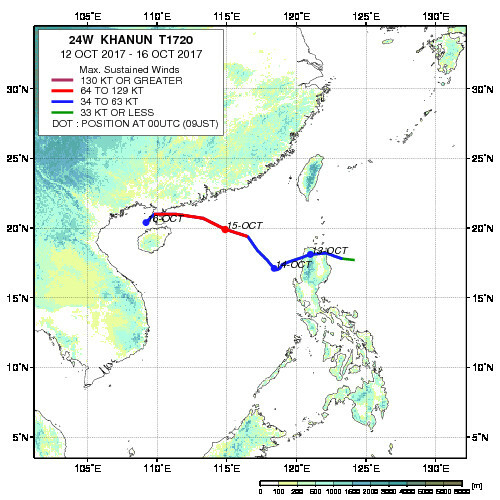 Typhoon ‘Khanun’ weakened and continued to track southwest bringing torrential rain and strong winds over northern Vietnam. 1.4 In October 2017, the prevailing winds over the southern ASEAN region were mainly from the southeast or southwest. In the northern ASEAN region, strong northeasterly winds extended from southern China to the Gulf of Thailand. 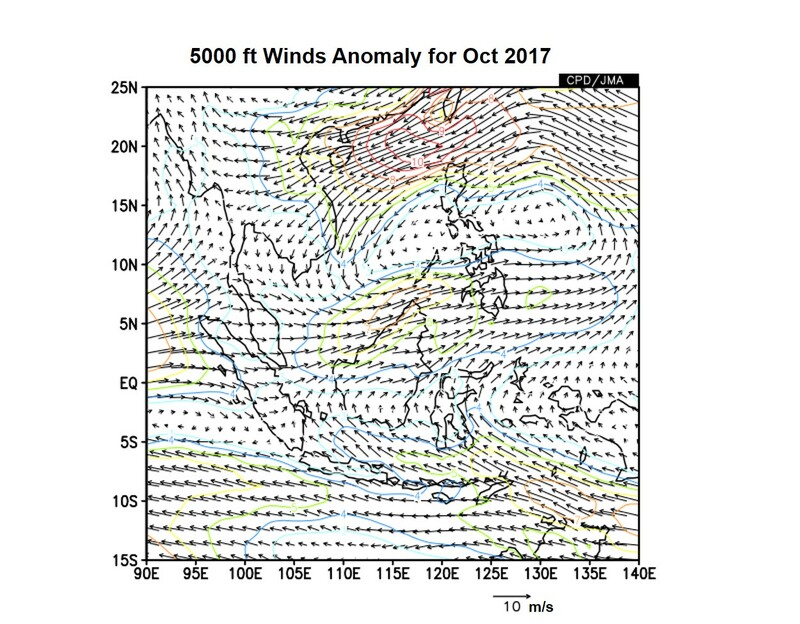 Broad westerly wind anomalies were observed over the eastern parts of the equatorial Indian Ocean, northern half of Borneo and southern parts of the Philippines. A cyclonic wind anomaly was also observed over the western Pacific Ocean, east of Luzon Island, the Philippines. In the second half of October 2017, a gradual weakening of winds around the equatorial region was observed. Figure 4 shows the average and anomalous winds at 5000 feet. 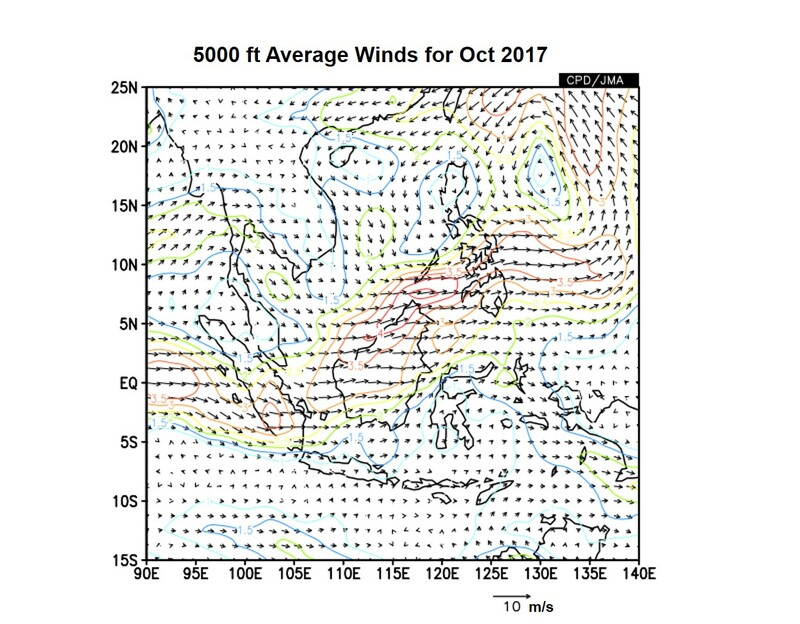 Figure 4: 5000 ft average winds (left) and anomaly (right) for October 2017. 1.5 In October 2017, the equatorial Pacific Ocean’s sea-surface temperature (SST) over the Nino 3.4 region remained within the neutral range (neither El Niño nor La Niña) although a gradual cooling tendency towards La Niña conditions was observed. In addition, most atmospheric indicators showed La Niña-like conditions with slight strengthening of the trade winds and below-average cloudiness over the equatorial Pacific. 1.6 The Madden Julian Oscillation (MJO) was weak and non-discernible during the first week of October 2017. 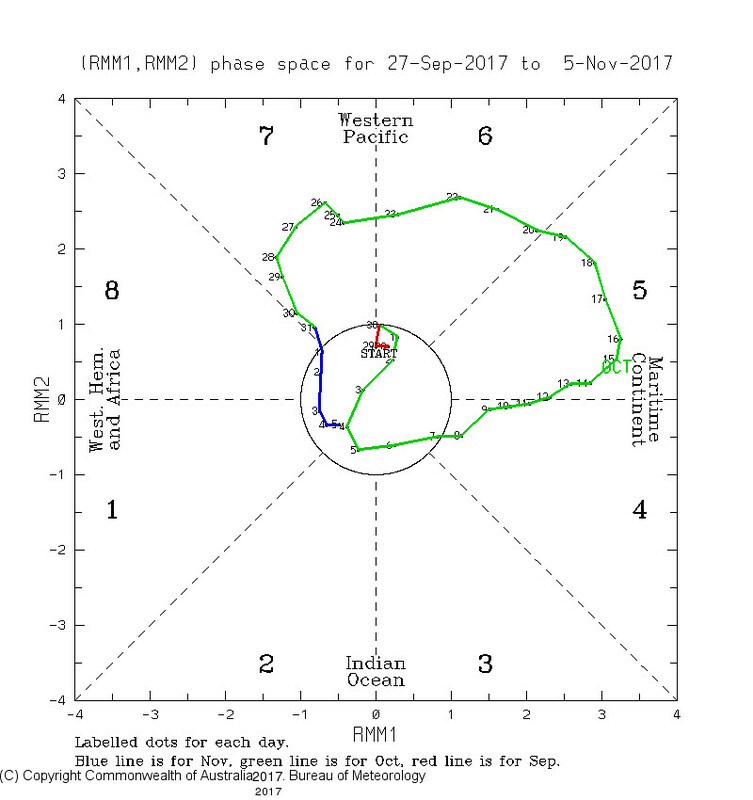 However, the MJO strengthened in the second week of the month and remained strong for the rest of October, transitioning from Phase 4 to Phase 7. The MJO was thus a major contributing factor to the rainfall over the ASEAN region. 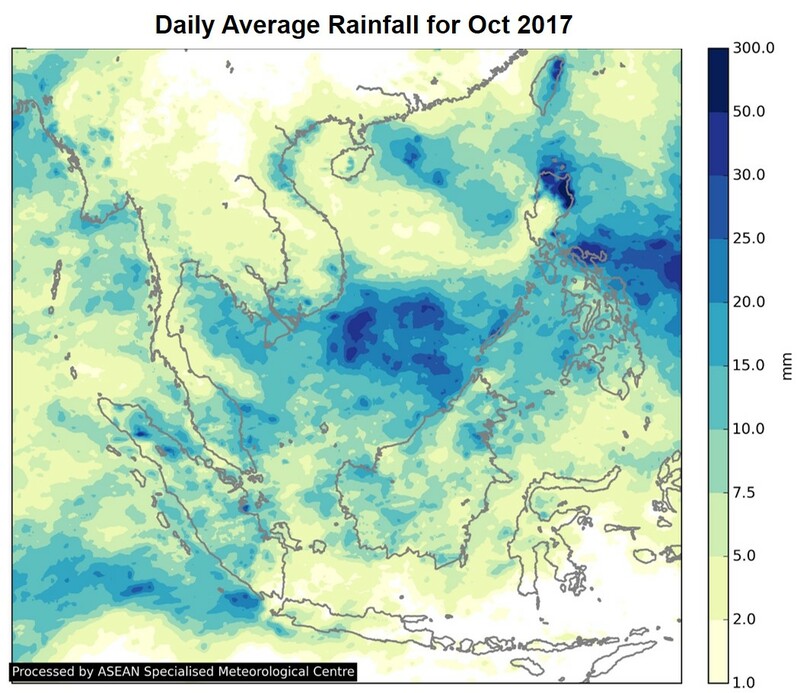 The MJO brought wetter-than-usual conditions over the ASEAN region in the second week of October 2017 and drier-than-usual conditions in the second half of the month. 2.1 Hotspot activities in the northern ASEAN region were generally subdued in the first three weeks of October 2017 due to wet weather conditions. However, during the last week of the month, dry weather conditions prevailed over the region, with isolated hotspots detected mainly over Myanmar. 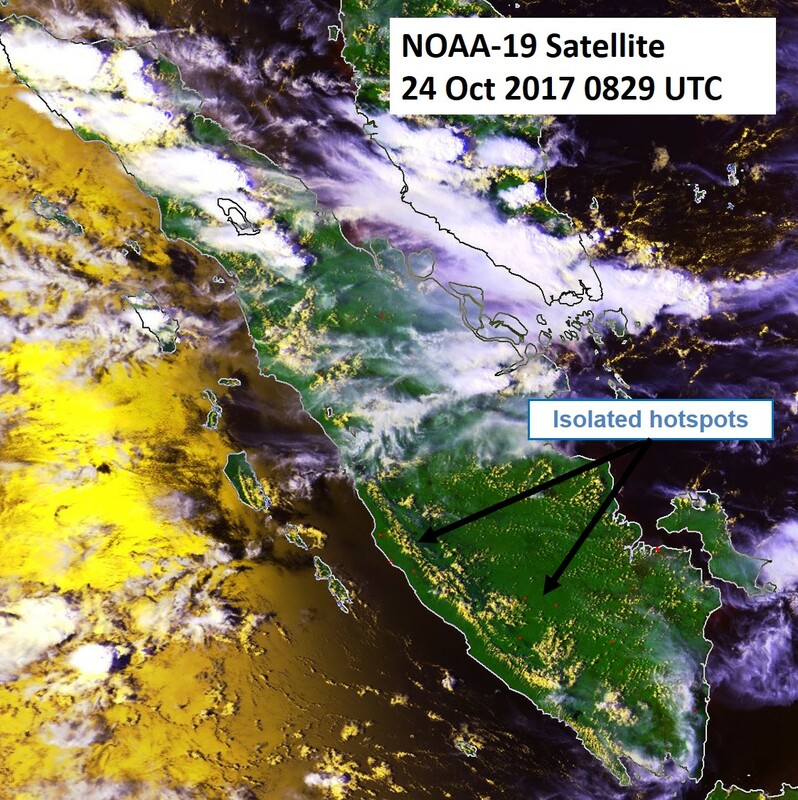 In the southern ASEAN region, isolated hotspots were detected over West Kalimantan, northern Sumatra and southern Sumatra. 2.2 In the later part of October 2017, Sumatra and Kalimantan experienced periods of dry weather conditions. This contributed to a slight increase in the hotspot activities detected mainly over West Kalimantan, northern Sumatra and southern Sumatra. There were no smoke haze and plumes observed near the vicinity of the hotspots. The return of shower activities during the last few days of the month helped to alleviate the hotspot situation in the southern ASEAN region. Satellite images depicting some of the hotspot activities over parts of the ASEAN region in October 2017 are shown in Figures 6 to 10. Fig. 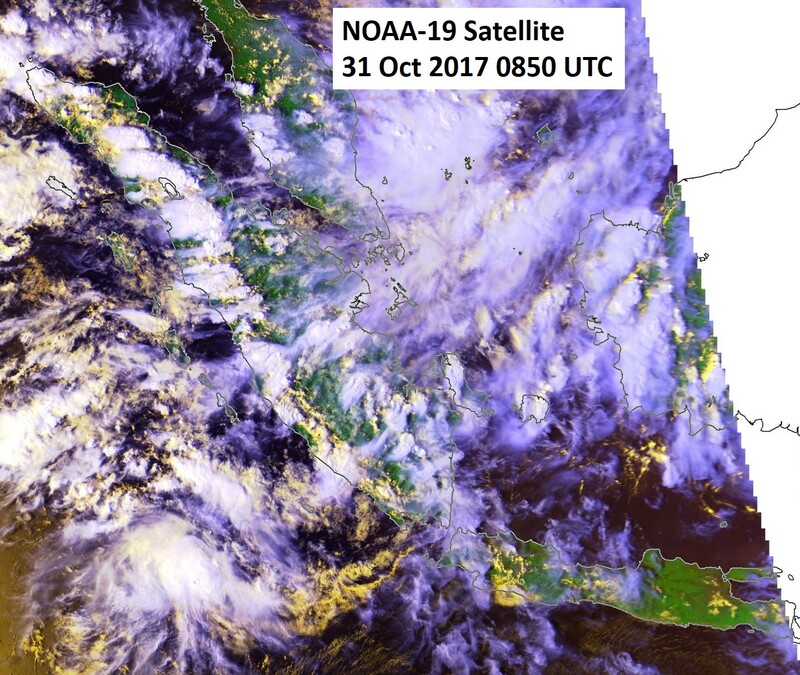 6: NOAA-19 satellite image on 5 October 2017 shows shower activities over Kalimantan. Fig. 7: NOAA-19 satellite image on 16 October 2017 shows Tropical Storm Talas located off the coast of Vietnam with extensive rain bands extending over northern Vietnam. 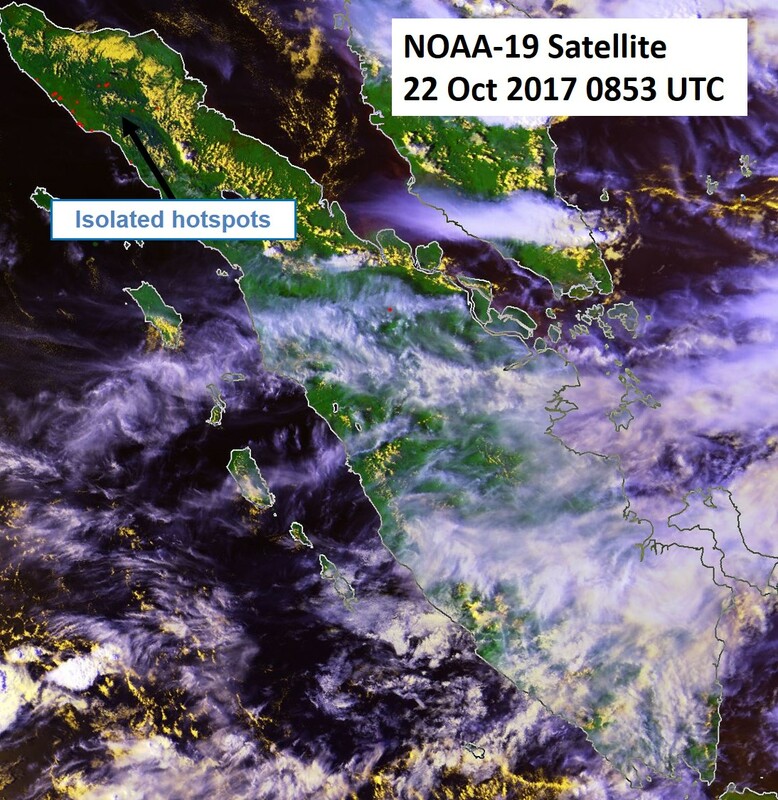 Figure 8: NOAA-19 satellite image on 26 October 2017 shows localised smoke plumes emanating from hotspots detected in West Aceh, Sumatra. Figure 9: NOAA-19 satellite image on 30 October 2017 shows hotspots over central and southern Sumatra following an extended period of dry weather conditions. 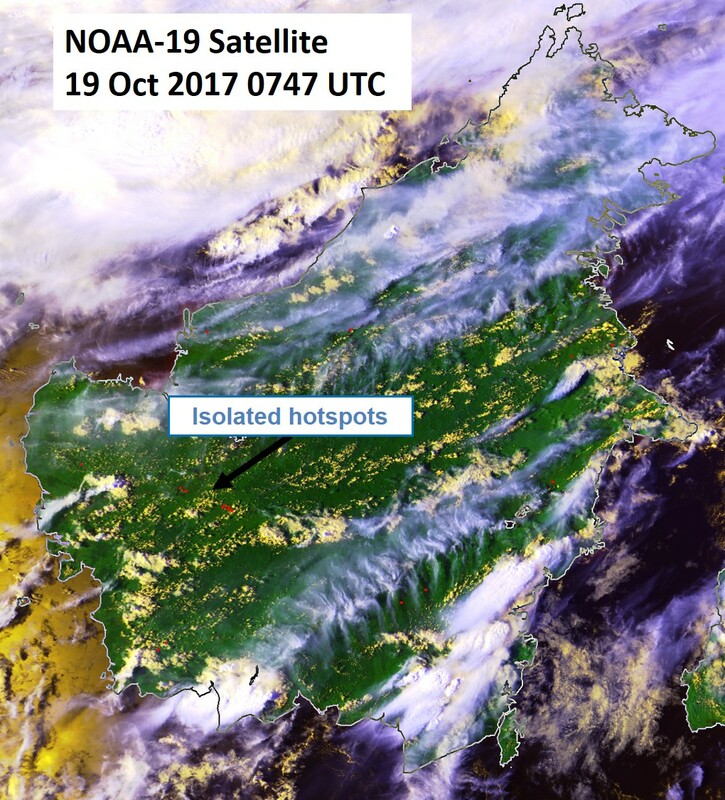 Figure 10: NOAA-19 satellite image on 31 October 2017 shows localised smoke haze observed near hotspots detected in West Kalimantan. 2.3 The hotspot distribution charts and daily hotspot charts for October 2017 are shown in Figure 11, Figure 12 and Figure 13 respectively. 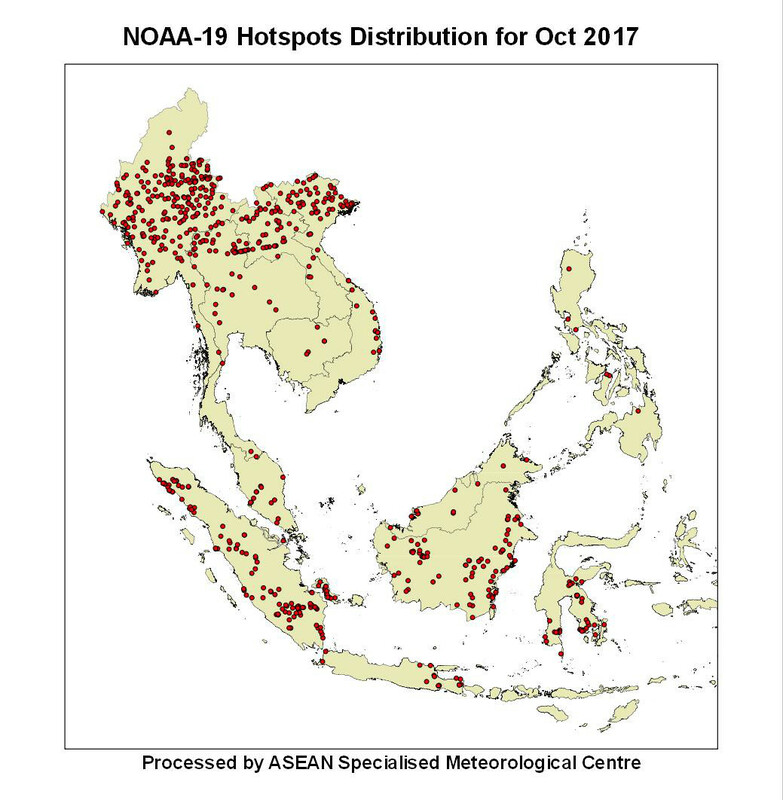 Figure 11: Figure 10: NOAA-19 hotspots distribution in October 2017. 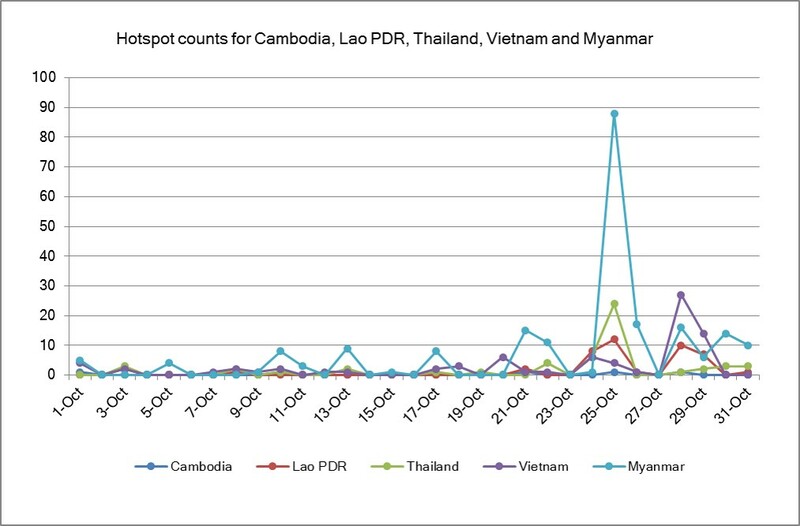 Figure 12: Hotspot Counts in Cambodia, Lao PDR, Thailand, Vietnam and Myanmar in October 2017. Figure 13: Hotspot Counts in Sumatra, Borneo and Peninsular Malaysia in October 2017. 3.1 Most models from major international climate centres have projected that the sea surface temperatures would continue to cool towards the end of 2017. During this period, the prevailing La Niña-like conditions are expected to be short-lived and persist until early 2018. 3.2 The region is currently experiencing Northeast Monsoon conditions. The impact of La Niña on the weather over the near-equatorial region is usually less pronounced during the Northeast Monsoon as compared to the Southwest Monsoon (Jun – Sep). 3.3 In October 2017, the Indian Ocean Dipole (IOD) index was neutral (Figure 14). In the coming months, international climate models forecast the IOD to remain neutral and it is not likely to have a significant influence on the weather over the region for the next few months. The formation of IOD typically starts around May or June, and peaks between August and October before decaying rapidly between December and April. 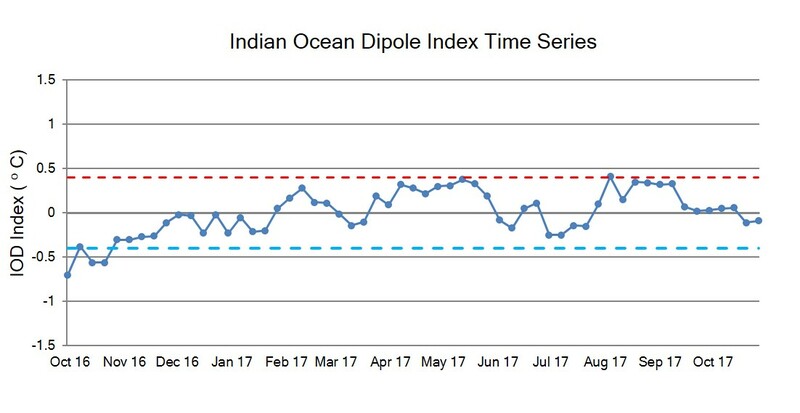 Figure 14: Indian Ocean Dipole (IOD) index time series. The IOD index is at the neutral level for October 2017. (Source: Bureau of Meteorology).